Ryan Coogler’s stunning first feature, 2013’s Fruitvale Station, proved his instincts as a storyteller. It also made apparent the force of nature that is Michael B. Jordan. That the two could go on just two years later to craft the fresh and vibrant Creed from the tired Rocky franchise showed that the blockbuster was as much in their mastery as the indie drama. But a Marvel superhero action flagship? That’s Big. Big budgets. Big canvas. And with Black Panther, big expectations. Are Coogler and Jordan up to the challenge? Just when you’ve gotten comfortable with the satisfying superhero origin story at work, director/co-writer Coogler, co-star Jordan and the stellar ensemble start thinking much bigger. And now, we need to re-think what these films are capable of. The action—whether air battles, hand-to-hand or via car chase—is breathtaking. Wielding a palette of colors and visuals unseen to this point inside the MCU—this set design is glorious, situating a SciFi tech metropolis easily within a world that still embraces ancient tradition, an isolated world that evolved in its own course rather than being led by the evolution of the world outside. Wakanda looks unlike anything we’ve seen in the Marvel Universe or any other. Not a minute of the film is wasted. Coogler manages to pack each with enough backstory, breathless action, emotional heft and political weight to fill three films. The cast shines from the top down, but there are some stand-outs. Chadwick Boseman, all gravitas and elegance, offers the picture perfect king—one who’s respectful of tradition yet still ready to open his eyes to the plight of his brothers outside his hidden nation of Wakanda. Side note: is there anyone more effortlessly badass than Danai Gurira? Trick question, there is no question—the answer is no. And though she has remarkable range (if you haven’t seen her 2013 indie Mother of George, give yourself that gift today), her General Okoye is here for the beat down. Lupita Nyong’o is also characteristically excellent in the role of the conscience-driven liberal. In a scene where she expects Gurira’s general to commit what amounts to treason, Coogler expertly reinforces an amazingly well-crafted theme mirrored in other pairings: the friction between surviving by force or by conscience. This theme is most clearly outlined by the conflict between Boseman’s King T’Challa and his new nemesis, Jordan’s Killmonger. Coogler hands this actor all of the most difficult lines. Why? Because it is material a lesser actor would choke on, and Jordan delivers like a perfectly placed gut punch. He sets the screen on fire, and though every single performance in this film is excellent, Jordan exposes the artifice. His castmates are in a Marvel superhero movie. Jordan is not. Instead, he is this rage-filled, broken, vengeful man and he is here to burn this world to the ground. His scenes with Boseman provide a cunning twist on the battle between a struggling hero and his evil twin. Usually a tired staple of sequeldom, BP adds an undercurrent of Shakespearean drama to the inevitable showdown of two characters who could easily represent the dueling inner conflict of one. 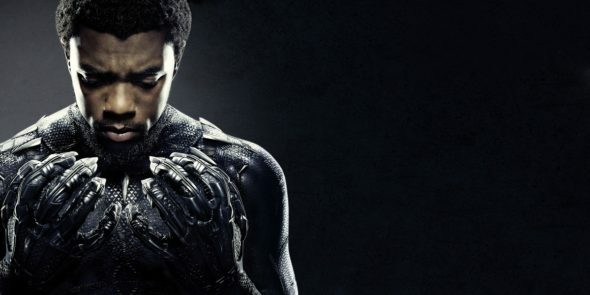 Coogler works with many of these basic themes found in nearly any comic book film—daddy issues, becoming who you are, serving others—but he weaves them into an astonishing look at identity, radicalization, systemic oppression, uprising and countless other urgent yet tragically timeless topics. The writing is layered and meaningful, the execution visionary. Blistering social commentary, brilliant escapist fantasy, eye-popping visual wonder—Black Panther has it all. Your move, every other superhero.